The liberation of Europe and the destruction of the Third Reich is an epic story of courage and calamity, of miscalculation and enduring triumph. An Army at Dawn begins on the eve of Operation TORCH, the daring amphibious invasion of Morocco and Algeria. After three days of hard fighting against the French, American and British troops push deeper into North Africa. But the confidence gained after several early victories soon wanes;casualties mount rapidly; battle plans prove ineffectual, and hope fora quick and decisive victory evaporates. The Allies discover that theyare woefully unprepared to fight and win this war. North Africabecomes a proving ground: it is here that American officers learnhow to lead, here that soldiers learn how to hate, here that an entirearmy learns what it will take to vanquish a formidable enemy.Many great battle captains emerged in North Africa, includingEisenhower, Patton, Bradley, and Montgomery. Atkinson brings thesecommanders vividly to life. He takes us to the front lines of everymajor battle -- from Oran to Kasserine to Tunis. In North Africa, theAllied coalition came into its own, the enemy forever lost theinitiative, and the United States -- for the first time -- began to act like a great power. 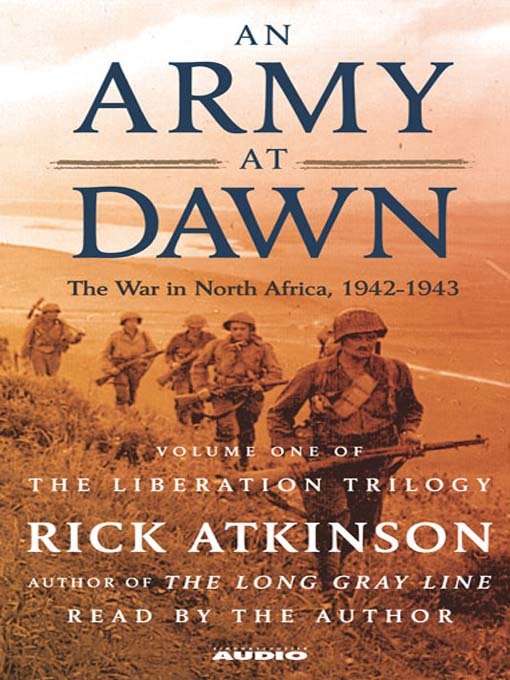 Atkinson casts a clear eye on the dark tragedies that haunt every war.The first volume of the Liberation Trilogy, An Army At Dawn ishistory of the highest order -- brilliantly researched, rich with new material and surprising insights, the deeply human story of amonumental battle for the future of civilization.